If you think a Riesling producer from the Mosel, and a Sangiovese (primarily) producer from Chianti Classico, couldn’t have much in common, think again. 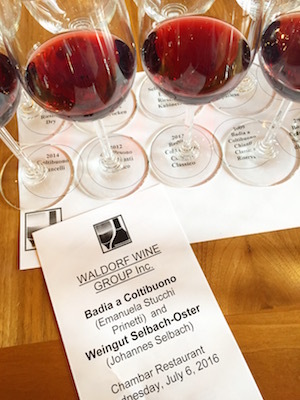 Recently, Emanuela Stucchi Prinetti, family member/owner of, and winemaker for, Badia a Coltibuono, and Johannes Selbach, family member/owner of, and winemaker for, Weingut Selbach-Oster, were in town. It was one stop on a short tour of the western provinces, and Minnesota. The interesting and most memorable association I had with the duo, was, I visited both of their properties, within a month of each other, in May and June of 2008. 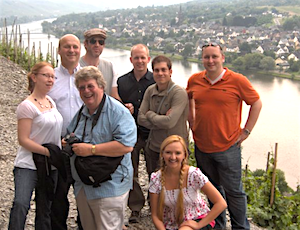 In May 2008, with a group of Canadian journalists and sommeliers, I trekked up into the vineyard with Selbach, to dizzying heights, high above the Mosel. Nearly a month later I was in Tuscany on a tour with journalists from Hong Kong and Estonia. One night, I found myself lodged at the stunning and historic family estate of Stucchi Prinetti - the 11th century, Badia a Coltibuono (Abbey of the Good Harvest). It was a good time to become reacquainted. Coltibuono (the winery) is home to 60 hectares of organically grown, estate vines. The badia, looking over the Arno River, in Gaiole-in-Chianti, totals 1000 hectares. Established in 1051, monks planted vines initially. The estate grew up until Napoleonic times, when it was taken away from the church and sold. In 1846, the badia came into Stucchi Prinetti’s family - that's an impressive 170 years ago. Stucchi Prinetti explained, the wines under the label of Badia a Coltibuono are made from estate only grapes. Those with the label Coltibuono are partially estate and partially purchased grapes. I wrote about my visit to Badia a Coltibuono in 2008, here. 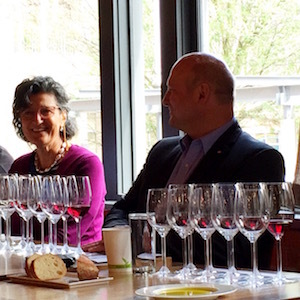 2014 Coltibuono Cancelli: 2014 was a tough year, quite humid, Stucchi Prinetti noted. 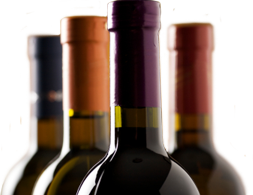 The wine itself is very juicy – it is made in a house wine (simple) style. Expect lively and expressive cherry and sweet raspberries, fine sweet spices, some tealeaf and leather. It is fresh, medium-bodied with some herbal undertones and fine peppery spices. Some texture, but overall, ripe tannins. 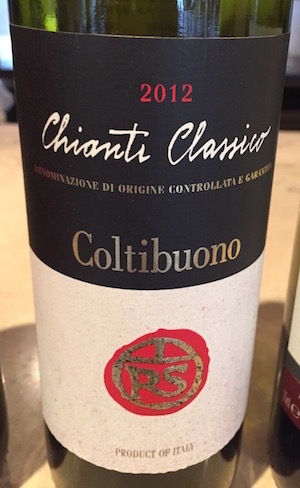 2012 Coltibuono RS Chianti Classico: 2012 was also a hard year, a wet year, but when they harvested, it took a turn for the better. Made from 100% Sangiovese and aged in neutral oak. Nose has more restraint than the 2014 Cancelli, expect tart red fruits with some herbal tones and fine spices. A slightly bitter palate also showcases tangy and tart fruit. A long finish trails some green tannins. 2013 Badia a Coltibuono Chianti Classico: Nice restraint and minerality here -- a chic wine. Great acidity and focus with tangy cherry, fine peppery spice some leather and tobacco. The tannins are fine and chalky. Expect mineral/clay type aromas alongside smoke and tart red fruit. The colour is starting to brick slightly. Lively mouthfeel - bright acidity, bruised violets and sweet fruit with some fruit rolling into a dried fruit or confiture stage – a nice juicy palate. 2009 Badia a Coltibuono Sangioveto di Toscana: Expect featured notes of wild herbs and tobacco with bittersweet cocoa and toasted spice, tobacco and leather. Good overall freshness here. A wonderful wine, solid balance and structure. Selbach commented on the parallels between the two family producers -- his and Stucchi Prinetti's. Both are small family operated businesses with a lengthy history and strong regional ties. Both have similar challenges and have seen equally positive changes, in the industry and within their own generation. Plus, climate change has forced both to make subtle changes in the vineyard. In the Mosel, the warmer temperatures have led him to leave more leaf cover, whereas they used to green harvest (cut back leaves to allow for more sun to penetrate the fruit). Similarly, in Chianti Classico, Stucchi Prinetti used to drop fruit for more intensity in the wines. Now, she leaves more fruit to ripen, to pull back on intensity and thereby maintain Coltibuono's brighter, and less fruit-forward house style. Selbach made another very valid point. Those from a certain age, let’s say 40 and older, are pretty much lost to him and other German Riesling producers. They draw too much memory association with the cloying bulk wines from the last millennium. “Unfortunately that consumer is still remembering one dimensional and sweet wines,” he noted. The younger generation, who never drank those styles are open-minded – they are the main consumer focus, now. “Riesling grapes like to be simmered to perfection not boiled to perfection. It needs a special place to grow, and so there is a lot of bad Riesling," he continued. 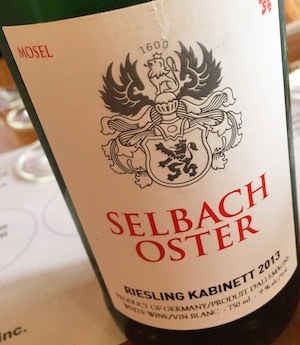 Selbach also wisely emphasized, “They [Rieslings] go with more than just Asian food, they are so versatile and can have a huge range of [pairing] possibilities. Selbach knows that sweetness is a confusing and contentious topic when talking Riesling -- as is the difficult-to-decipher German labeling system. He recommends an easy way to decipher it on your own If you check the alcohol levels on the wine and it falls between 6-9% alcohol it’s going to be sweet. Look for a Riesling at 10% alcohol and above, for a drier style. 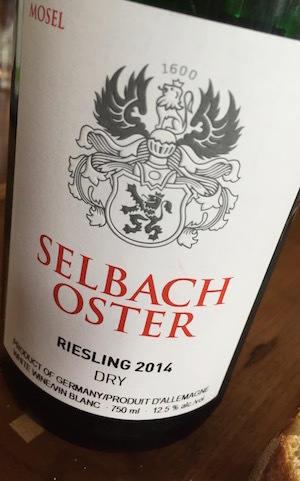 2014 Selbach Oster Riesling Dry: Delightful – crunchy green apple, lemon drops, crisp tree fruit and white floral talc. Pristine and concentrated with mineral notes. Nice spritzy palate with a mineral texture – it is racy focused, lengthy and purposeful. Very dry with great depth. Sellback noted 2014 was a classic vintage nicely showcasing those “silvery flavours” you get from the Mosel. 2013 Zeltinger Himmelreich Kabinett Halbtrocken: smoky and flinty and marmalade and golden apples nice rich colour with some honey and lemon tea. Racy and a kiss of sweetness intense concentration. Lemon tea with honey. Delicious.lengthy ripe and chic. Expect aromas of honey, green apples and lemon drops, fresh quince (not jelly) and great flinty notes. It boasts gorgeous weight with a kiss of sweetness and is mouthwatering and mineral-driven on the palate. Beautiful flowery flavours alongside and golden fruits. Stunning – a standout -- a wine I would drink every day. 2013 Selbach-Oster Zeltinger Schlossberg Spatlese: Expect smoky, flinty and lemony notes layered with crunchy golden fruit. The palate is (expectedly) significantly sweeter than the kabinett, yet still deliciously balanced. It doles out flavours of lemon tea with honey. Lengthy and slick, weighty but not oily. Lip smacking finish. 2012 Selbach-Oster Zeltinger Sonnenuhr Auslese: This wine was a bit closed on the nose. However, pristine golden fruits, flint and marmalade roll across a the tongue, mouthwatering acidity helps to cleanse the palate. Stylish so well balanced, weighty but not oily, focused with pristine expression. Beautiful.